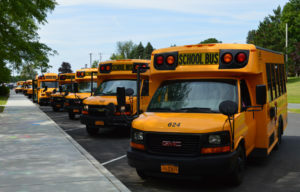 East Greenbush Central School District has proposed the replacement of 10 older school buses and the creation of a new bus purchase reserve fund for the 2018 Budget Vote and Board Election on Tuesday, May 15. As part of the District’s bus fleet management plan, it plans to trade-in 10 older school buses and replace them with new buses that have better fuel efficiency, lower emissions, improved safety features and lower costs for maintenance and repairs. Nine of the buses would be purchased from the District’s bus purchase reserve fund with no impact to taxpayers. The final bus would be purchased through a bond referendum with the first payment coming in 2019-20. The district would be reimbursed for approximately 62.5% of the total school bus purchase. The new bus purchase reserve fund would replace the current fund, which was authorized by voters in 2010, but needs to be replaced because it has reached the limit of $5 million in deposits over its life under state law.